Below we post an edited version of Surekha Agarwal’s report on a work placement at the Society which took place earlier this year. We are very grateful to Surekha for her contribution and for taking the time to share her reflections on her time here. It all started when I responded to an email from Edward (Librarian at the RAS) asking for a library volunteer to help with the cataloguing of its printed collections. As I live in Bristol it was not possible for me to do one afternoon a week, so I responded by requesting if I could do it over a week/fortnight while staying in London. To my delight this was accepted and Ed very kindly made it worthwhile by making it into a week-long placement so I could get an insight into this special library and the work they do. I reached the Royal Asiatic Society (RAS) on Monday the 4th of January and was greeted by Ed, who after basic housekeeping took me on a tour of the building. The Royal Asiatic Society, a UK registered charity, was founded in London in 1823, and received its Royal Charter from George IV the following year. The mission is to promote public understanding and scholarly research into the languages, histories, cultures, and arts of Asia. It accomplishes this mission by making available to the public its extensive collections of books, manuscripts, archives and artworks. The society also publishes journals and academic monographs and hosts lectures and events. The Society is governed by an elected Council, and members of that Council usually serve for a three-year term. This is the room where the council has its meetings. 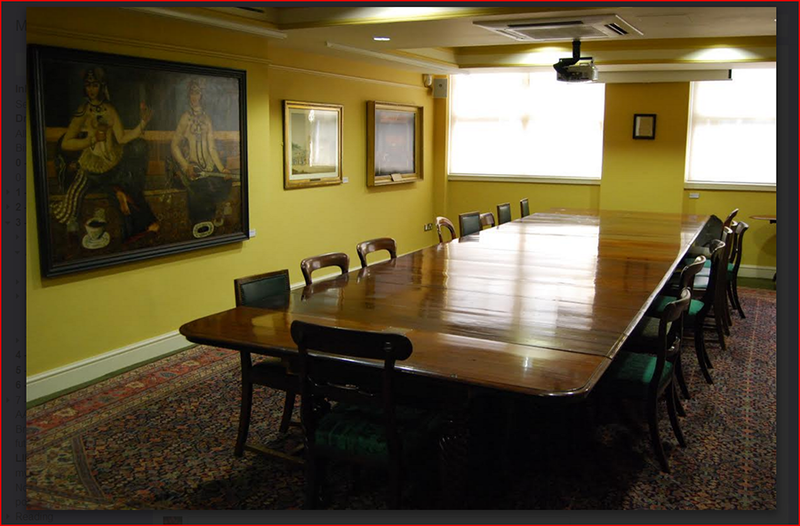 The Royal Asiatic Society acquired the table in 2007. This table is called The Jhansi table (formerly the property of the Rajas of Jhansi). As I am from India, I immediately developed a bond with it and was pleased to see that the table was maintained so nicely even after all this time. 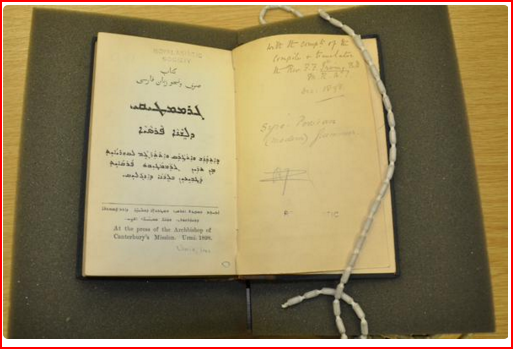 The Royal Asiatic Society has extensive collections including in Persian, Arabic, Ottoman Turkish, Pali, Sanskrit, Malay, Javanese, Tibetan and Burmese. 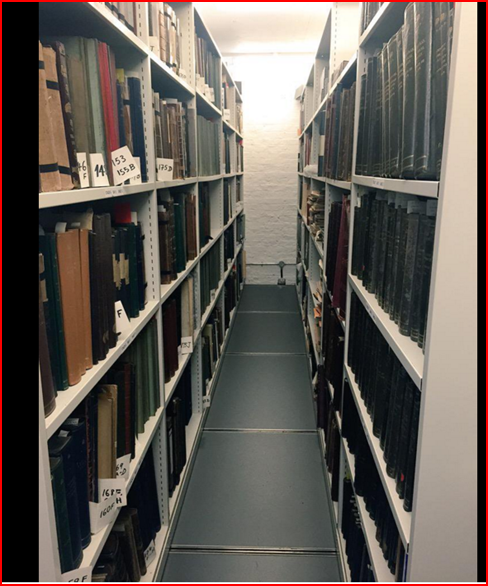 The collections include over 60,000 books, journals and pamphlets, 2000 manuscripts, 5000 photographs, extensive archives, and hundreds of paintings and drawings. The printed collections date back to the sixteenth century. 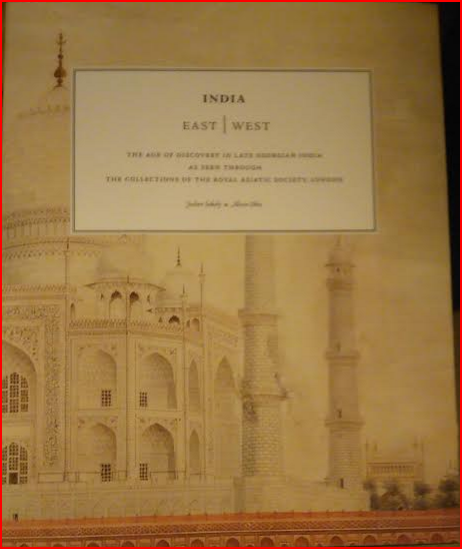 The core of the printed collections is nineteenth-century material, and the collection is representative of the development of Oriental studies from the late-eighteenth to early-twentieth centuries. 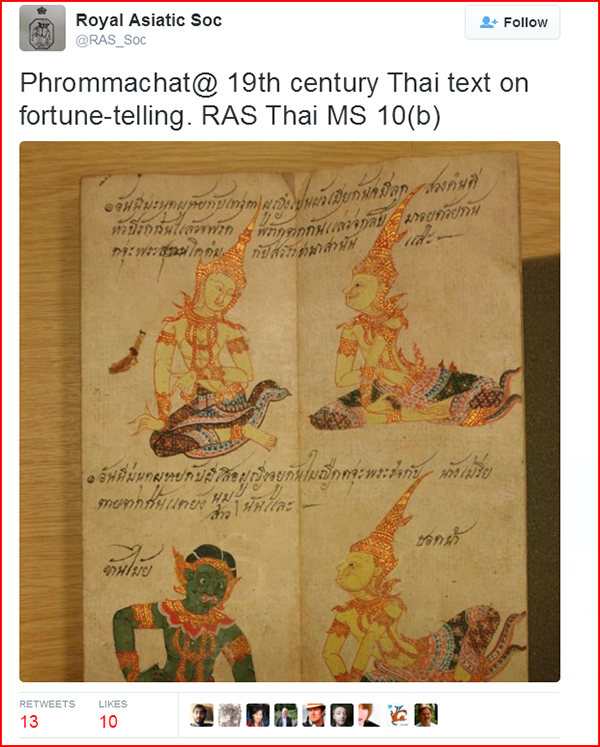 A vast range of subjects are covered, with the main strengths being in languages, philology, art, history, literature, religion, and philosophy (see https://royalasiaticsociety.org/library/). The collections are mainly housed in the strong room in the basement. The books are all on the rolling stacks and the manuscripts (individually wrapped in acid free tissue paper) are stored in special archival boxes. The temperature and the humidity are carefully monitored. There is also an alarm which detects water, in case of a leak or flood. This is a manuscript from the Hodgson Collection. 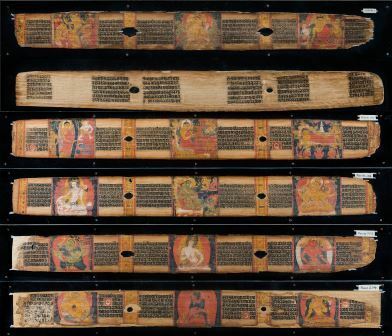 The manuscript is in Sanskrit and it is done on palm leaves. Each palm leaf folio has 6 lines. Each illustrated leaf is separately encased and the entire collection is carefully preserved in the bespoke box as shown in the image below. 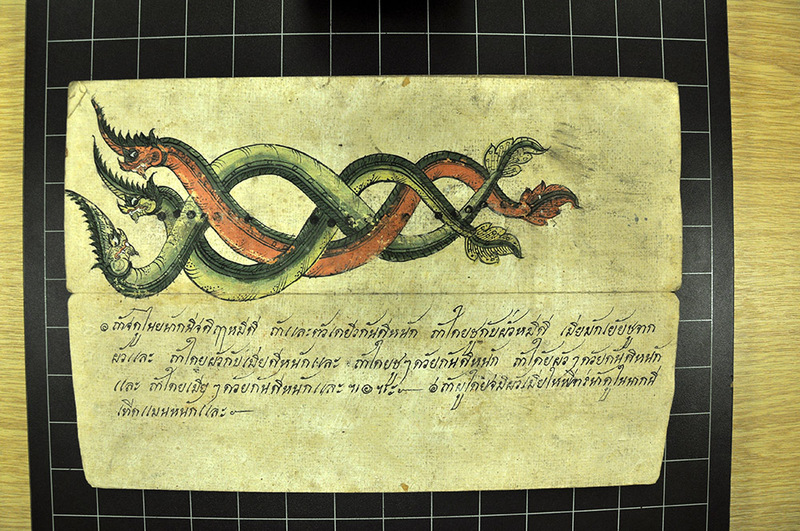 This is a manuscript from Thailand. It has 55 folios. The cream folding book has text in black ink with coloured and gilt illustrations. The text is about omens, fortune telling and match making. Below is an example of how this was done using the dots on the different nagas/snakes for guidance. 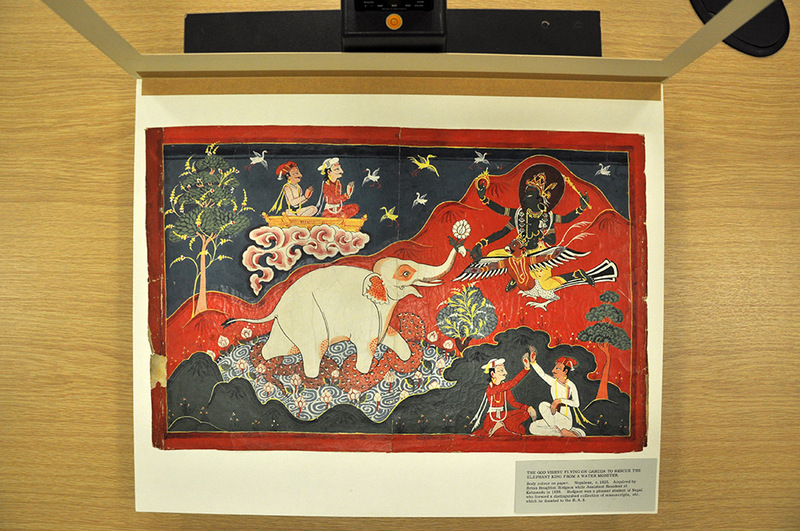 In addition to the beautiful manuscripts and books in the collection, there are intricate, skilful pieces of artwork from all over Asia hanging on every wall of the Society. 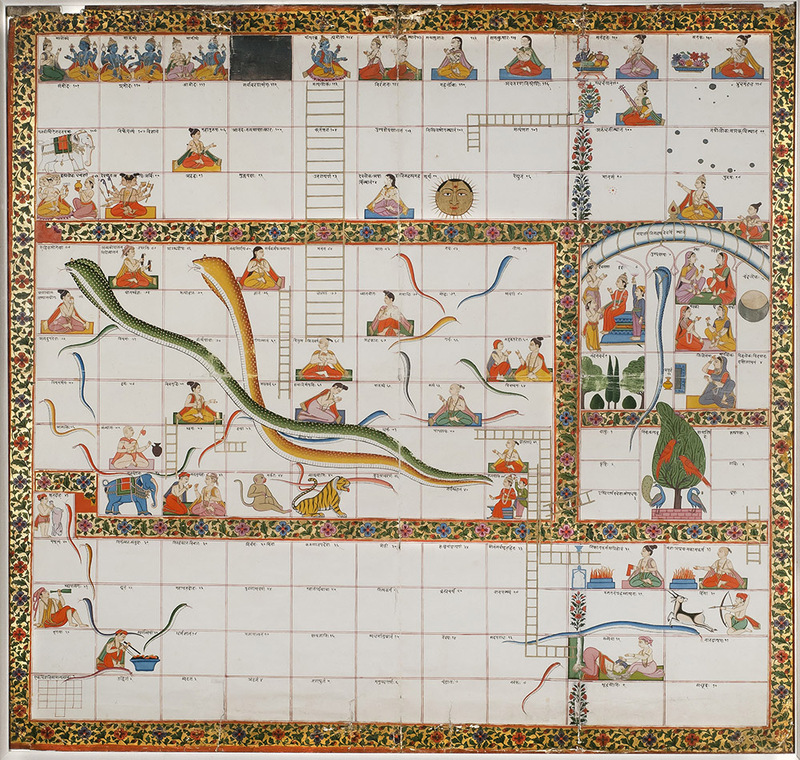 Design for the game of Snakes and Ladders / Robertson, H. Dundas, (Henry Dundas) (c. 1800). This was painted in 1800 by an Indian artist. This is a Gouache on paper mounted on cloth: picture size: 84 x 90 cm, frame size: 92 x 97 cm. Fine treatment of figures and ornamental borders of flowers on gold. The chart is divided into 124 squares all with Sanskrit inscriptions. They are numbered starting from the bottom left. The player proceeds from the ‘Hell states’ of 1-41, through the moral and spiritual states of 42-88. Squares 89-124 are concerned with celestial attainments. Ladders connect the ‘good’ squares while snakes join the ‘bad’. This chart has a separate side compartment of 13 squares for those who have succumbed to spiritual self-interest. This miniature painting from the collection of Brian Houghton Hodgson was on loan to the Victoria & Albert Museum (V&A) between the 1960s and the 1990s. When such a painting goes out on loan they are mounted on archive mounts (as shown) which helps to preserve them. The collection is ‘closed-access’ which means the shelves are not available for browsing. 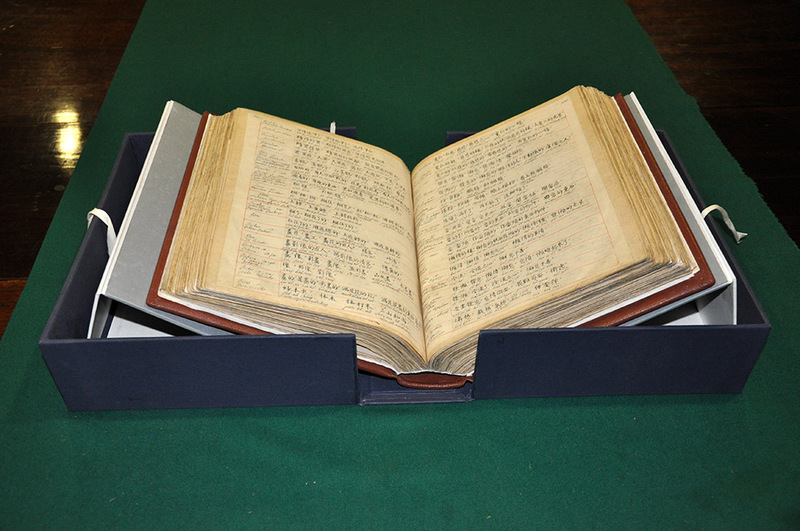 Most of the books are listed on the online catalogue and some records can also be searched on Copac. 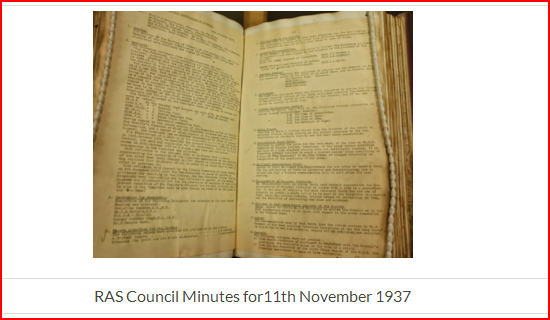 The archival records are being made available through Archives Hub. Readers can make requests for books, manuscripts etc. which can be made available to read during opening hours in the Reading Room. The Reading Room is supervised by the library staff. The users have to follow certain rules such as no food and drink and no photocopying. Free wifi is available and users can also take digital photos (without flash). Users can also request for images to be sent to them for a minimal charge. A copyright declaration form needs to be filled for each image used. Materials like sponge support wedges, book weights and book snakes are provided to minimise damage to the collection. 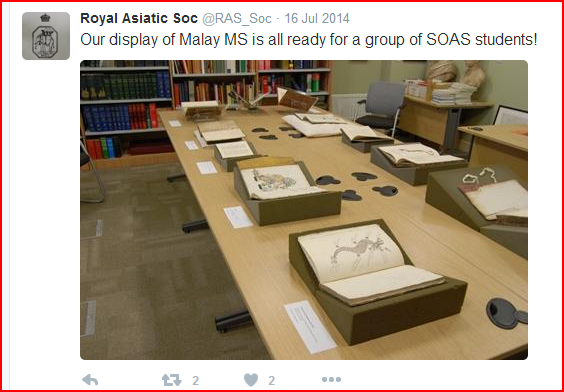 This image from twitter shows a display of Malay MS ready for students from SOAS. 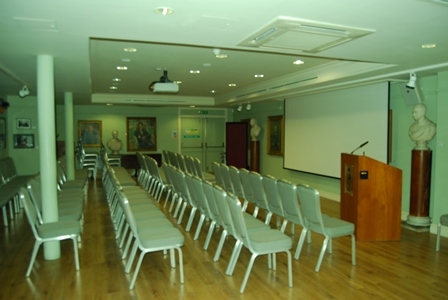 The society also hires out rooms for lectures, meetings and conferences. This is an image of the lecture theatre which can seat up to 80 and is equipped with AV. The society also runs free regular events. These events are organised by the staff and images and manuscripts from the collection are sometimes displayed in a cabinet during lectures. 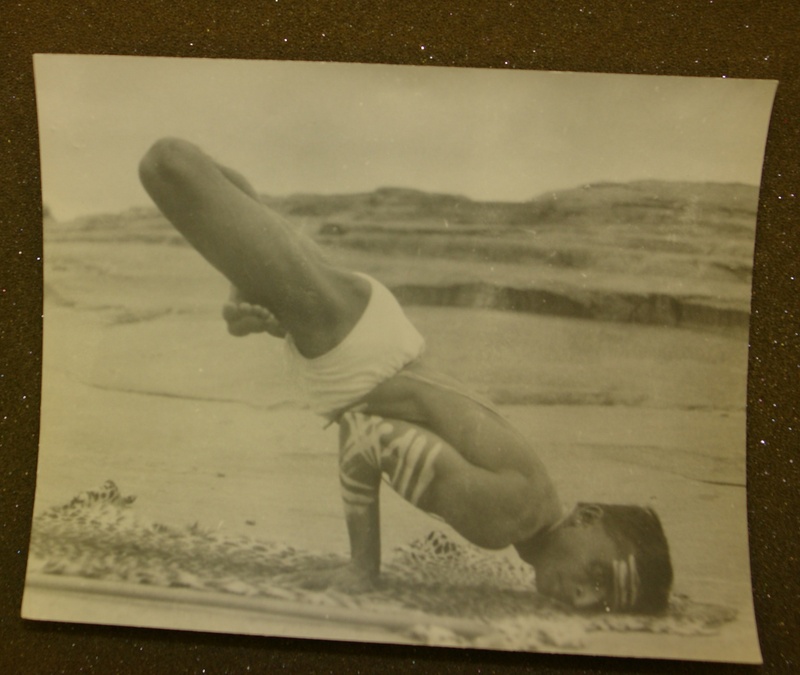 I helped to put up a display using materials from the collection on Yoga for the forthcoming talk “A History of Yoga and Yoga Scholarship” by Dr Sir Jim Mallinson (SOAS). 2. 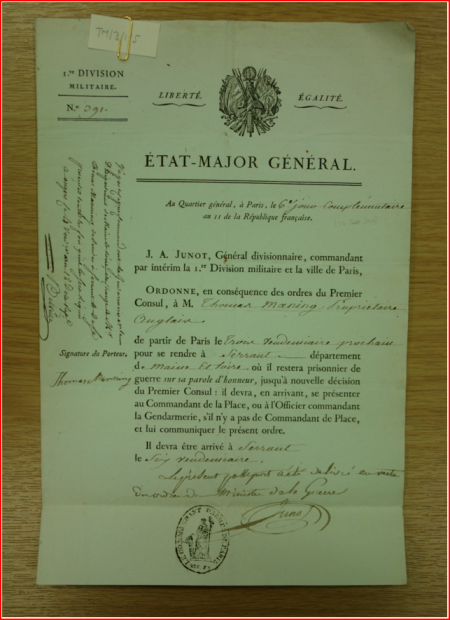 Private papers, such as those of Brian Houghton Hodgson, Sir Richard Burton and Sir William Jones. The society recently acquired the archive of Thomas Manning (1772-1840). Nancy Charley, the Archivist, ensures that as each collection is catalogued it is re-packaged as appropriate and, if necessary, cleaned using a smoke sponge. The public is made aware of the collections through social media and by hosting events. Nancy regularly tweets and the online content gets an international audience. Whilst I was there, a student from the Camberwell College of Arts who was doing a 2 year MA in conservation had visited to see two of the manuscripts, one of which he was considering doing some conservation work on for his MA project. I also learned that the Society uses the services of The National Association of Decorative & Fine Arts Societies (NADFAS) in a project to clean and conserve books. RAS Chinese 1, Latin-Chinese dictionary (Beijing, 1745 CE). See one of the completed volumes below with bespoke custom box with foldable stands to support the dictionary. The conservation cost approx £20,000. I learned to use the Liberty Softlink Library Management System and did cataloguing in MARC21 following the Anglo-American Cataloguing Rules (AACR2). Ed showed me how to catalogue a book from scratch, but I mainly did copy cataloguing using a module called ‘Z-cataloguing’. 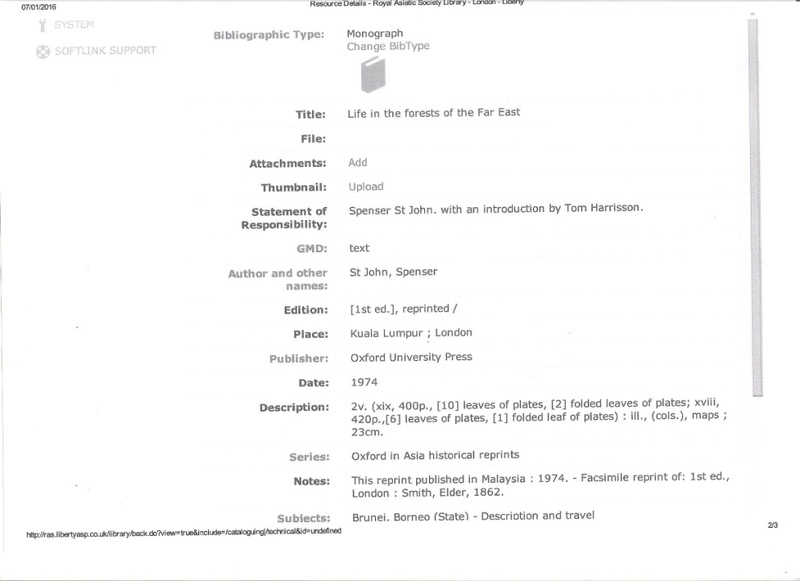 I downloaded records from the British Library or Oxford University and then amended them according to RAS house style by editing some fields and adding classmarks. I did cataloguing every day and am delighted to say that by the end I was able to catalogue multiple copies of the same title and also catalogue multi-volume works with accuracy. I particularly enjoyed the challenge of entering data in the MARC ‘300’ field, making notes of the number of plates, illustrations and folded leaves etc. I got valuable first-hand experience that could not be gained from any traditional training course. Ed and Nancy talked about their roles and responsibilities. They were kind and patient and incredibly generous in sharing their comprehensive knowledge with me (a true reflection of a librarian). We discussed professional development and potential places for volunteering and getting experience. Ed talked about ways of developing professionally and signposted me to some websites which could be of interest to me, and Nancy talked about her volunteering placements at University of Kent, National Theatre and in record management at King’s College London. This opportunity allowed for an interesting exchange of ideas and a better understanding of potential career paths. On Friday afternoon I got to watch a film (the only archival film in the RAS Collections!) about an archaeological dig at the ancient site of Nineveh which was both fascinating and educational. The week flew by and soon it was time to leave. I took leave with a heavy heart with an assurance that I could come back for another placement, perhaps during the summer. Ed very kindly gave me a parting gift of one of the books published by RAS. I am grateful to Ed and his team for the opportunity. 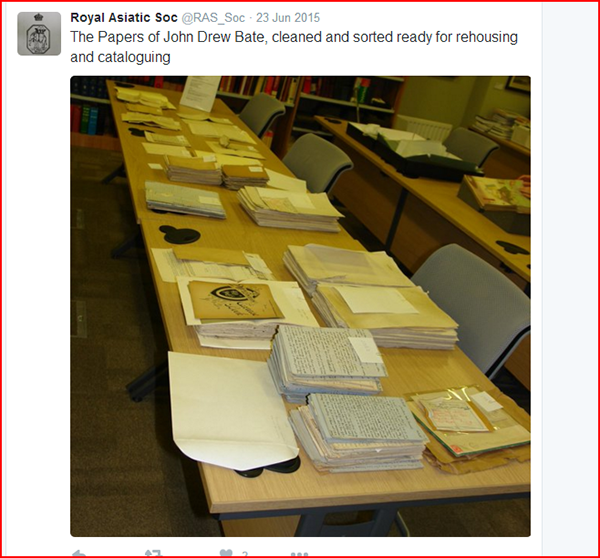 I thoroughly enjoyed the placement: not only did I get to enhance my cataloguing skills, but I gained valuable knowledge of the job profile and skills of the staff at RAS, a useful perspective of a special library, and added valuable contacts to my network.